1. What is the VIX? Most people think of the VIX as a fear barometer of the market – when market participants become nervous, the VIX goes up – or at least it is supposed to. This is the extent of what most people know (or think they know) about the VIX. 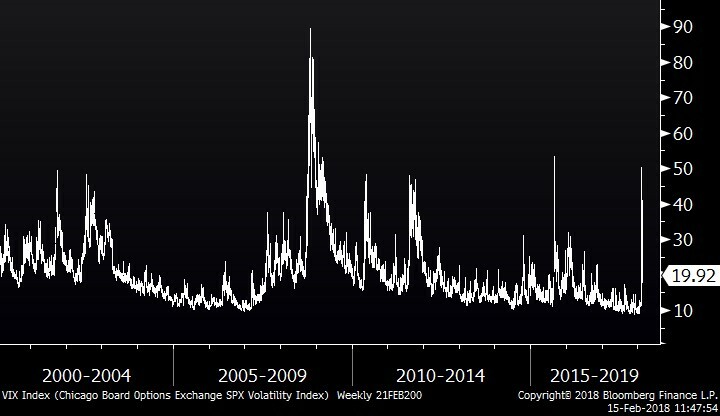 In reality, the VIX is the abbreviation for the CBOE volatility Index, which is meant to be a proxy for the market’s expected volatility going forward 30 days. It is basically reverse-engineering a part of the math sophisticated options traders are using to decide how much their options are worth. Contrary to popular opinion, it is NOT an actual calculation of the volatility of the S&P 500. The VIX is used as the backbone of a growing number of volatility-based products which have grown in popularity partially as a result of automated and passive investing. To price the index, the implied volatility built into the prices of S&P 500 index options are calculated. So, in the end, the VIX is a derivative of S&P 500 index options volatility, which is a derivative of call and put options on the S&P 500, which are a derivative of the stock prices of a collection of 500 stocks, which are derived from an infinite number of emotional, technical and fundamental inputs. 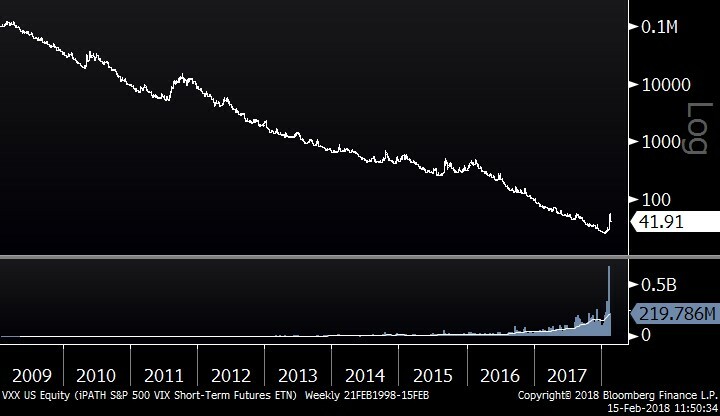 One cannot buy or sell the VIX itself, so they have created VIX futures, which are another level of derivatives in this equation. Essentially, speculating on the VIX involves a complicated chain of derivatives on top of derivatives – a chain very few market participants understand. 2. What is a VIX ETF? A VIX ETF is a product created to mimic the movements of the VIX index. They use derivatives to attempt to accomplish this goal, so investors are adding yet another level of derivative to the mix. These products are readily available to even the most inexperienced couch potato speculator. 3. What is an Inverse VIX ETF? These are the ones that blew up last week. These are ETFs, again available to anyone with a brokerage account, using yet another layer of derivatives to bet against the movement of the VIX. This setup has a major and predictable flaw, even on top of all the other hurdles piling derivatives on top of each other creates. These instruments have billions of dollars “invested” in them. While there might be some value to these as a hedging technique in certain highly-sophisticated investment funds, last week’s events brought to light how some of these instruments really work. If you look at the top chart of the VIX, you will note that it tends to show readings of below 20 during normal times and then it spikes to multiples of its “normal” value in a very short period as soon as expected volatility rises. As you can see, in the most recent episode, this reading spiked 5x to its second highest level since 2008-09. This should have meant a huge gain for the VIX ETF, rewarding all of the people who have been expecting this for years, right? WRONG – it only retraced its value back to September 2017. Also note the long-term downtrend, which is represented in logarithmic scale. Due to the multiple layers of derivatives built into this security, this ETF will always want to trend downward – it is like fighting a gravitational force that always seeks to approach zero. If you think this is ugly so far, let’s take a look at the inverse VIX ETF. When something is designed to be inversely correlated to an underlying instrument, it is meant to move in the opposite direction, in a similar magnitude. 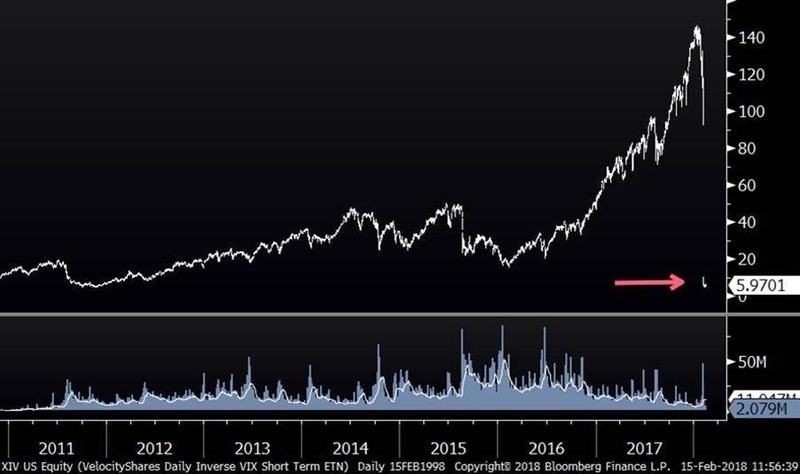 This seems relatively straight forward, but if one thinks about the implications for a second, it is painfully obvious why the inverse VIX ETFs were a ticking time bomb. Imagine you have a $100 and want to bet against a financial instrument. The next day, that instrument rises 20%. As a result, you now have $80. This is quite painful, but now imagine that you are dealing with an instrument like the VIX that has proven time and time again that it can (and will) move up over 100% in a short period. If you bet against it with your $100 and the VIX doubles the next day, it is game over for your capital. This is essentially what happened with the billions of dollars placing these bets. After writing this, it occurs to me that my attempt to “laymanize” this subject matter has failed. In fact, it may be impossible to do so. 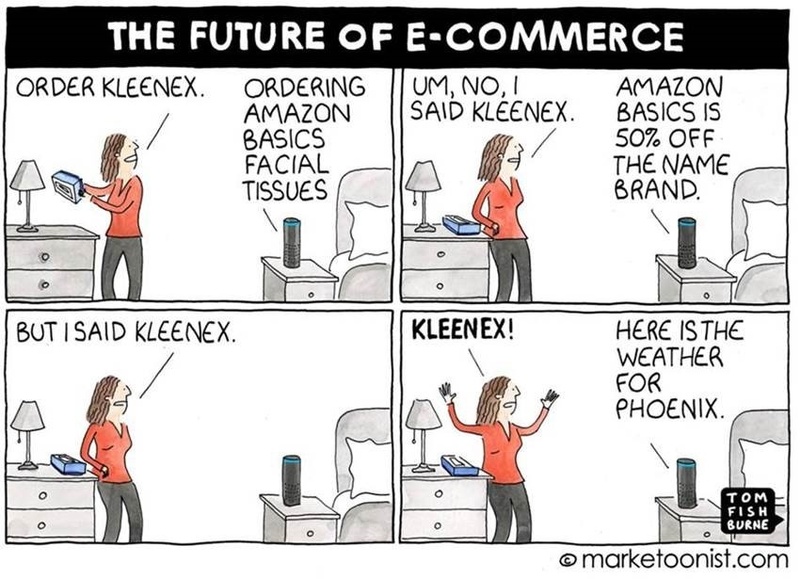 As such, perhaps these products should not even be made available as widely available investment products that SEEM to make sense.